The Hayabusa 2 space probe already took samples of asteroid Ryugu’s surface, the so-called regolith, in February 2019. These are materials that were exposed to space weather and therefore to the solar wind and may not be native of Ryugu but dust and pebbles arrived from space. To try to get samples of materials that haven’t changed in who knows how many millions of years the Japanese space agency JAXA created the Small Carry-on Impactor (SCI) system and a more complex procedure than the one carried out to take samples from the surface. The SCI operation began more than a day before the impact that generated the crater on asteroid Ryugu with a series of maneuvers that allowed the Hayabusa 2 space probe to descend to about 500 meters above the surface. At that point the SCI system separated along with the DCAM3 camera, which aims to observe and map the precise location of the projectile’s impact. 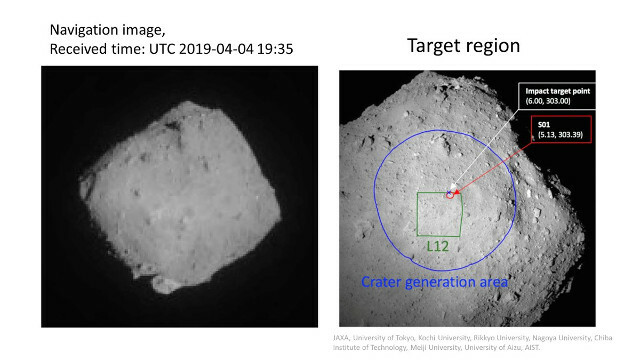 The camera is needed because Hayabusa 2 didn’t immediately start its sampling operations but started moving away from Ryugu’s surface to avoid the risk of damage caused by debris coming from the crater, much greater than those generated in the operation carried out in February 2019. Only about 40 minutes after the separation of the CSI system from Hayabusa 2 the explosive fired the bullet into the surface of Ryugu generating the crater. Image (courtesy of JAXA, University of Tokyo, Kochi University, Rikkyo University, Nagoya University, Chiba Institute of Technology, Meiji University, University of Aizu, AIST. All rights reserved) shows on the left side asteroid Ryugu photographed by the Hayabusa 2 space probe during its approach and on the right side the region where the crater was created, more or less the one in the blue circle with at the center the impact area indicated by the white dot. Now at JAXA they’ll conduct an assessment of the situation in the area of Ryugu asteroid where the new crater was created, especially to make sure that the debris fall on the surface and there are no dangers for the Hayabusa 2 space probe. Only if that assessment will be positive, in about two weeks a new descent operation will be performed to try to take samples of debris from Ryugu’s subsoil.